Support from folks like us, combined with Lionel's introduction of the best-selling Polar Express train have caused Lionel's "stock to rise" among train lovers of all ages. Today Lionel is selling more kinds of train sets with more road names and more different locomotives than they have in decades, including the Berkshire locomotive they reintroduced in the Polar Express set and the realistic-looking, solid 0-8-0 they are now including in several sets listed on this page. Whatever you want to do with your trains, we're here to help, with information, tough questions, and help finding hard-to-find sets. Please contact us early if you have any questions, though - we do get swamped with questions by mid-November and stay that way until about Valentines' day. Note about Availability and Pricing: Although I try to keep an eye on things and to recommend products that are reasonably available, the model train market does fluctuate, and any product on this page may change price or become unavailable without prior notice. November, 2016 Update: I don't usually have time to keep checking back between Halloween and Christmas, but I had to check this page for another project, and I discovered that a new-for-2016 train I had first heard about this summer and recommended this fall has already sold out. So this is another reminder not to wait too long. For more detailed information about why model train products seem to come and go and why we have stopped listing prices on our "buyer's guide," please see the article "About Pricing and Availability." The Lionel(r) Pennsylvania Flyer Remote Control Train Set - This train features a rugged die-cast Lionel 0-8-0 locomotive with working headlight, operating smoke unit, and whistle. The set includes two freight cars, a large FasTrack layout, and the powerful CW-80 Transformer. Note: This train used to have an Atlantic 4-4-2 locomotive; now it has an 0-8-0, which is a different style that is just as much fun to run. If you have the old Pennsylvania Flyer and you like Pennsylvania RR, this is a good addition to the old set. This set features PRR's famous "port-hole" caboose. Again, if you want this train (or any train on this page), avoid disappointment and order now. Please click a button for more details, or to check price and availability. We have threebuttons because at the moment, three different versions are available on Amazon at the moment. The second button is the old version without remote control. The third button is an even older version, also without remote control. Lionel Wild West Set-Lone Ranger Train Set - This train was reintroduced without fanfare in 2010, but has come into high demand. Many folks over the years have liked the old-timey look of this set. The set includes a large FasTrack layout, and the powerful CW-80 Transformer. It was new in 2013, and supplies are starting to get a little thin, so if you want this train (or any train on this page), avoid disappointment and order now. Please click a button for more details, or to check price and availability. The Lionel(r) New York Central Flyer Train Set with RailSounds - This year's version has been upgraded with the addition of the helicopter car. The tough die-cast metal 0-8-0 locomotive equipped with the RailSounds sound system brings the Flyer to life with steam chuffing, whistle blowing and more. This set also a boxcar, caboose, gondola with load, CW-80 Transformer, smoke fluid, "How-to" instructional video and more. There is enough track to make a 40"x60" oval. Lionel has introduced several versions of this train over the years. This is an upgrade version with RailSounds and an extra car. Next year's set will probably be a little different, so if you like this set, and especially, if you're counting on having it around your Christmas tree this year, don't wait too long. Click on the Amazon button for description and pricing. Like the set above, this set was introduced in a previous year. It includes the famous "walking brakeman" car. I don't know how much stock of this model is left, but if you are a Union Pacific fan, don't let this one slip through your hands. Click on the Amazon button for more details and pricing. "Scout" remote control train set. This is a reboot of one of Lionels's most popular "entry level" trains. It used to be pulled by a diesel locomotive, but now is pulled by a steam locomotive. The real improvement is that it is now remote-controlled. Also, it use to be labeled "Union Pacific," but the company that owns Union Pacific is now charging all toy and model train manufacturers to use their names on trains - even the name of railroads that no longer exist. You'd think they'd appreciate the free advertising, but that's not how it works. So this train is labeled a "Lionel Scout," but it's a good example of the "starter sets" that circled most Christmas trees between 1927 and 1960, most of which were labeled "Lionel Lines" anyway. This set was introduced a while back, but sold out quickly. At the moment it seems to be available again. It uses Lionel's "Porter" 0-6-0 locomotive, which isn't used in many starter sets. The ones that use it tend to sell fast. This set is also unusual in that it has three freight cars and a caboose. It is currently in VERY SHORT supply. This train came in in December of last year, but a few folks still managed to pick them up before Christmas. The train features an 0-4-0 "Porter" locomotive with a diamond smokestack and three "shorty" cars. 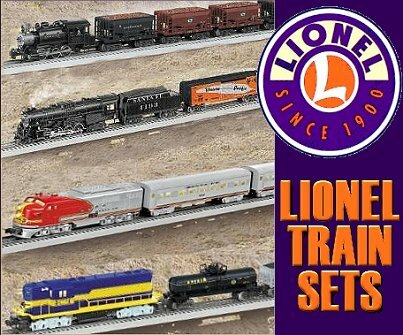 Lionel's O Gauge Thomas set is a solid starter set with many of the features of their more "realistic" trains. It was first introduced several years ago. For a long time, it was the only track-powered Thomas set in production that made sense to let kids play with. This version has a remote control so the kids don't even have to handle the transformer to run the train. No, you can't give it to your five-year-old in a box and hope for good (or even safe) results. But once you have put it together, your kids will get a lot of play value out of it. 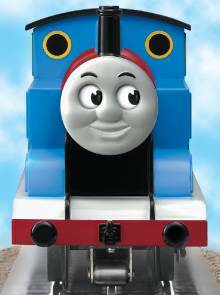 Thomas's eyes move as he goes around the track, pulling Annie and Clarabel. There is also enough FasTrack track to make a 40" x 60" oval. Editor's Note: If you want a really big set, Bachmann is now making a Large Scale set that is especially suited for outside or for display railroads. I have a set, and I have to say that either train creates a great deal of excitement when kids are around. If you're interested in seeing the Large Scale version, click here and scroll down the page. On the other hand, if you're interested in a version that won't take over your house, click the Amazon button to the right. James now has his own train, including remote control, a caboose, and track. This train is in VERY short supply. Expand Your Empire With More Track. Most of the trains on this page come with Lionel's new "FasTrack," which looks better and goes together easier than traditional O-27 track. To give your train a little more room to run, consider adding a few pieces. This 10-inch Straight Track Section is the same as the pieces that come with the all of the sets on this page. Please click on the button to check price and availability. Lionel FasTrack Curves A set of four curved pieces, along with a few more straight pieces, will give you many more choices of how to set up your railroad. 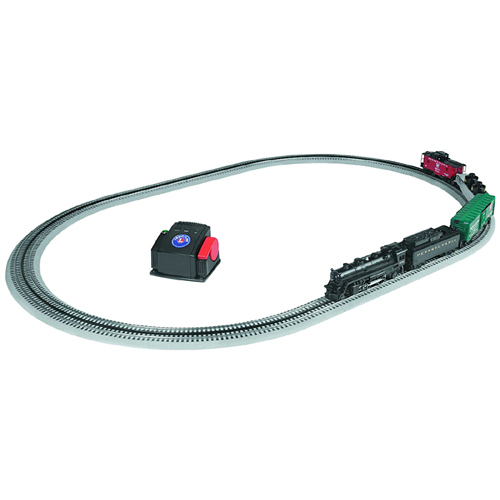 These are what Lionel calls O-36 curves, the same curves that come with all of the sets on this page. Please click on a supplier button to check price and availability. Lionel FasTrack Railer - The Railer is used to help you and your family easily roll your locomotives and rolling stock onto the tracks. No more fiddling with the wheels to get them on correctly. Instead, you set this on top of the track temporarily and "feed" each car through it to get it onto the track. Great for kids who are just learning about trains. This product works with all the train sets on this page. "O Scale Accessories - Our O-Scale Accessories page includes many relatively inexpensive details such as bridges, fencing, and stations, that will bring life to any O-Scale or O-Gauge railroad. Click on the picture at the right to see that product page. "O Gauge Christmas Trains - If you are getting a train set just for Christmas, check out the O Gauge Christmas Trains page. This page features Lionel's exclusive Polar Express train, complete with a Berkshire locomotive, three passenger cars, and several add-on car options. Other Christmas trains and accessories are also featured. These trains will also look nice with your Christmas village structures, if you have room for a track circle (about 40" minimum). "Tribute to Tinplate" Project Articles - This is not a buyer's guide page, but a series of projects that pay "Tribute to Tinplate," based on the tinplated-steel trains and towns of a century ago. You make the structures out of cardboard, but our free downloadable commercial-grade graphics and instructions will help you make heirloom-quality reproductions of classic tinplate stations, bridges, and more. Inexpensively add an authentic vintage look to any indoor railroad. Note: Family Garden Trains(tm) and Big Christmas Trains(tm) are trademarks of Breakthrough Communications (www.btcomm.com). All information, data, text, and illustrations on this web site are Copyright (c) 1999, 2000, 2001, 2002, 2003, 2004, 2005, 2006, 2007, 2008, 2009, 2010, 2011, 2012, 2013, 2014 by Paul D. Race. Reuse or republication without prior written permission is specifically forbidden.